You’d think being in the funeral industry, I’d attend a lot of funerals or life celebrations. I guess fortunately for me that’s not been the case. However, today I paid tribute to a former co-worker by joining a group of old friends on the San Francisco Bay for the scattering of Ken’s ashes. There were a couple of nice touches that made the scattering very personal. The first one, which ties very closely to my last post, was that Ken was scattered with his best buddy in the whole world, his dog “Tinker Bell”. One of his friends was carrying a small wooden box and I thought, hummm that’s too small to be Ken (Tinker Bell was a yorkshire terrier). Turns out they realized on the way over that the wooden box was screwed shut. They promptly called another friend and asked that they bring a drill. Quietly, Ken and Tinker Bell were joined together in one urn which was Ken’s request. The second detail I liked was, on top of Ken and Tinker Bell’s cremated remains were dried rose petals. 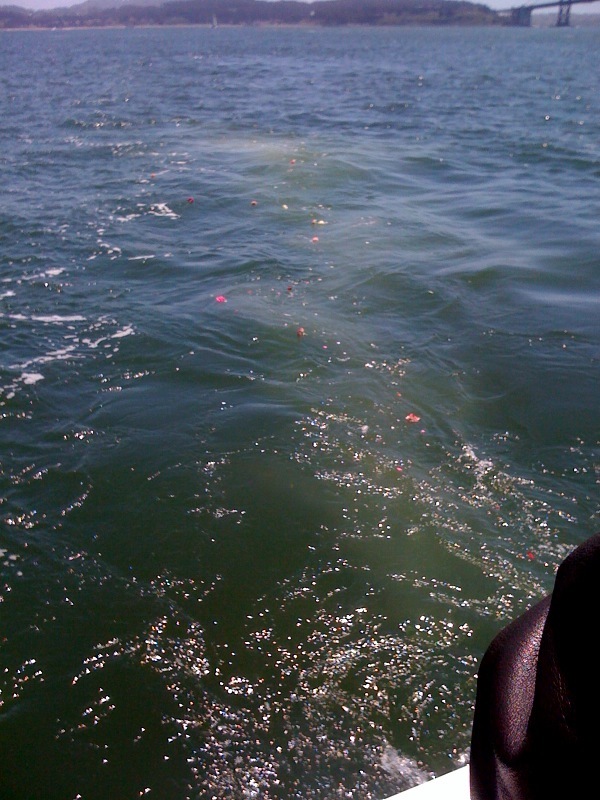 When the ashes were scattered behind the boat the rose petals gently floated away. The third detail also has to do with flowers. When we boarded the boat, we were each handed a flower. After his brother scattered his remains (done by putting the urn very close to the water over the side of the boat and then turning it over.) Obviously, you want to scatter ashes as close to the water as possible. After the remains were in the water we threw the flowers that had been give to us in the water, and some people brought flowers and those were thrown in at the same time. I’ve included a photo of the flowers and petals in the water. Next, I really liked how one person read a tribute to Ken. She talked about how it was working with him and how he became part of her family. At my suggestion, we went around the group, there were about a dozen of us, and introduced ourselves and said how we knew Ken. Not only did this help me put a name with a face but also helped me place the role each person played in his life. 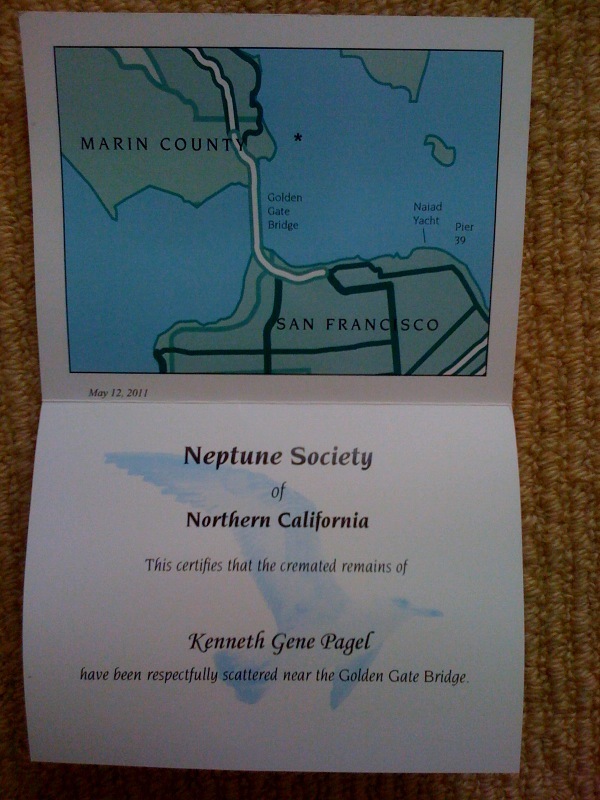 Lastly, the Neptune Society gave each of us a card that showed where Ken’s ashes were scattered with a nice photo of the Golden Gate Bridge. Overall, I was very impressed with the entire service. It was dignified, very personal and having perfect weather on the San Francisco Bay set a wonderful tone. Ken would have liked his own service but he’s off to Hawaii now with Tinker Bell. He’ll be missed! 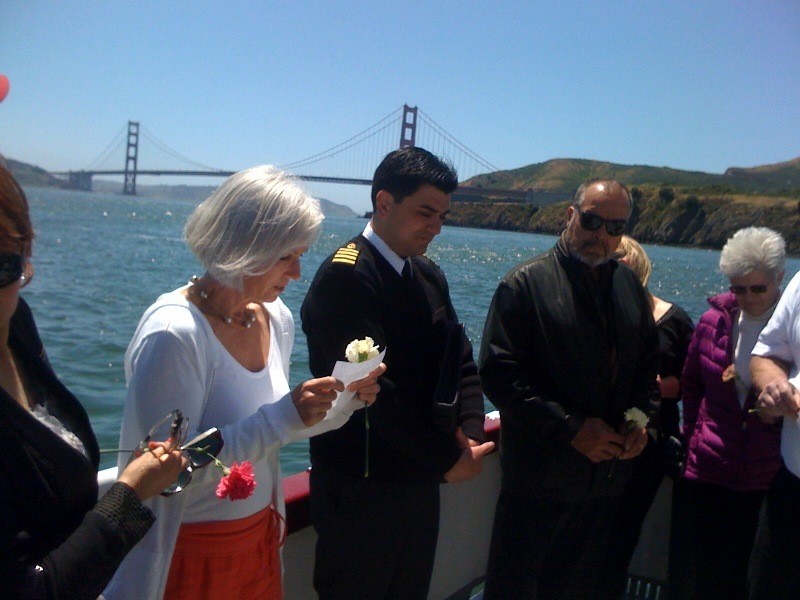 This entry was posted in How to Scatter Cremated Remains, Life Celebration Ideas and tagged flowers for scattering remains, ideas for life celebration, Neptune Society San Francisco, San Francisco Bay scattering of cremated remains, scattering ashes, scattering ashes from a boat, scattering your ashes with your dog. Bookmark the permalink.